If you’re looking to buy your first boat, these 10 starter boats are all excellent options. If you’re buying a starter boat and it’s the first time you’ll own a boat of your own, you need to make a good choice or the results could be disastrous. And this choice will be a tough one—“starter” should not just mean “cheap,” and you need to make sure your first ownership experience will include reliability, safety, and ease of use. So, how are you going to know which to pick? Start off by checking out these six great starter boats, which we thought were ideal for beginner boaters. The Bayliner Element: Welcome, beginner boaters. 1. Bayliner Element – The Element has a lot of things going for it: it’s simple but versatile layout and functionality requires few to no complex systems or accessories; it doesn't require much power (a 60 horsepower outboard is standard), yet provides the ability to enjoy everything from water skiing to fishing to sunbathing; and it’s shockingly inexpensive, starting at about $14,000. Performance is just about right for a first-time boat owner, with a mellow cruising speed in the low 20’s and a top-end of about 31-mph. Plus, at 16’2” long, 7’5” wide, and 1,750-lbs it’s also easy to trailer. 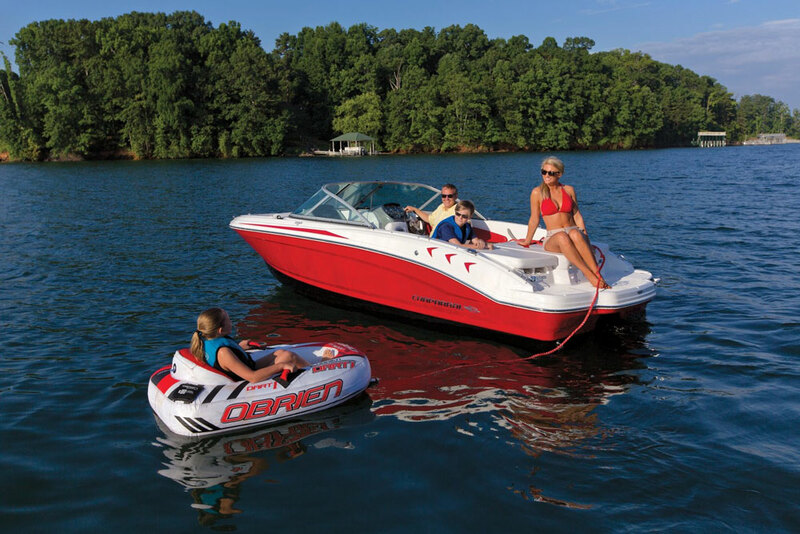 Being part of the Bayliner family it’s also widely available at dealers from coast to coast. For more information, visit Bayliner or read our full review, Bayliner Element: Need an Inexpensive Runabout? Deckboat? Bowrider? If the Element seems like a good fit for you, see some listings here. Ready for a power cruiser? 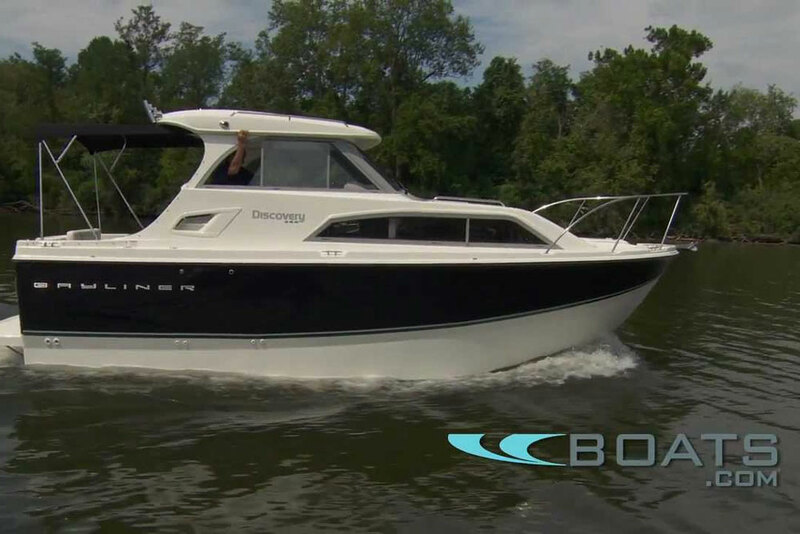 The Bayliner Discovery 266 isn't exactly a yacht, but it has a lot to offer the beginner boater. 2. Bayliner Discovery 266 - Though it may be considered large for a starter boat, this pocket-cruiser has an enclosed cabin and a completely protected helm station, yet still manages to fit in a (small) cockpit for fishing, sunning, or relaxing. Belowdecks there’s a mid-cabin berth, a full galley, a V-berth, and a stand-up head—which is a lot more than most boats of this size can offer. Performance is good, too, with a cruise of about 30 MPH when powered by a Mercury 5.0 stern drive. W did wish for more cockpit space, but of course, that would force the sacrifice of cabin space. Also, we should note that this boat has a high center of gravity and is a bit tender. For more information visit Bayliner, watch our Bayliner Discovery 266 Video Boat Review, or check out these Bayliner Discovery 266 listings. 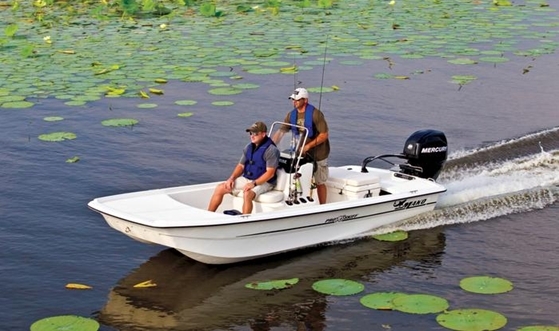 Boats don't get much simpler and easier to deal with than the Carolina Skiff J16. 3. 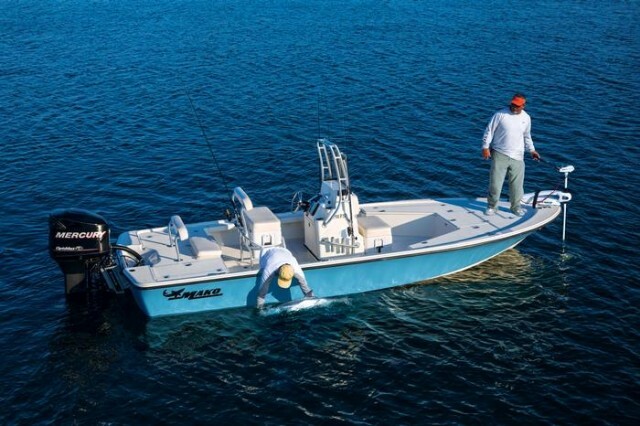 Carolina Skiff J16 – Simplicity counts for a lot in your first boat, since it makes it easy to learn the ways of the water without a lot of complex instruction manuals, systems maintenance, and equipment failure. 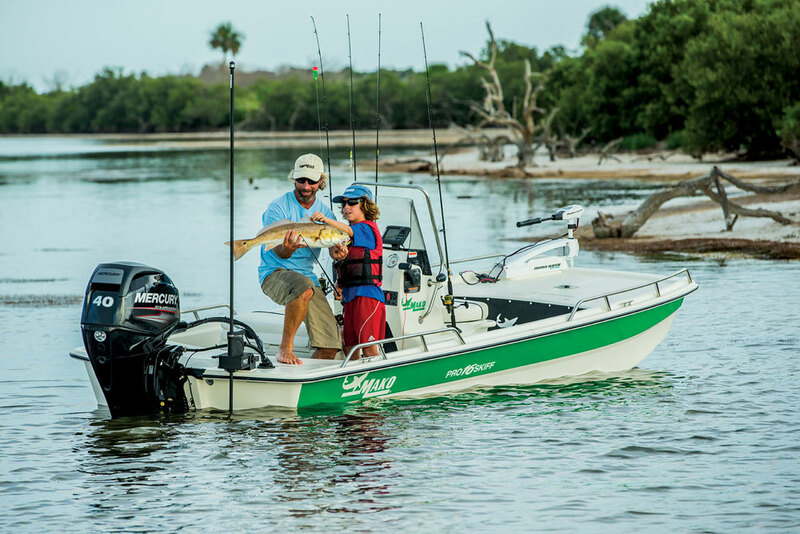 Few boats are as simple as the J16 and for that reason, it’s a top pick as a starter boat. It’s also strong as a rock, with a foam-filled hull supported by foam box-beam logs. Cost is eminently reasonable, and you can get this boat with a small outboard (40 horses is the max) for under $10,000. The ability to add seats, consoles, and decks as you please also makes it semi-customizable, though cost quickly goes up as you add more goodies. And remember that this is a flat-bottom boat. As a result it’s extremely stable and has a very low hull draft (just six inches), but when it gets choppy the ride is rather rough and can get wet. Surprise Bonus: this is one of the smallest boats around that can self-bail in the slip. For more information visit Carolina Skiff, or read our full review, Carolina Skiff J16: Simplicity is Beauty. 4. 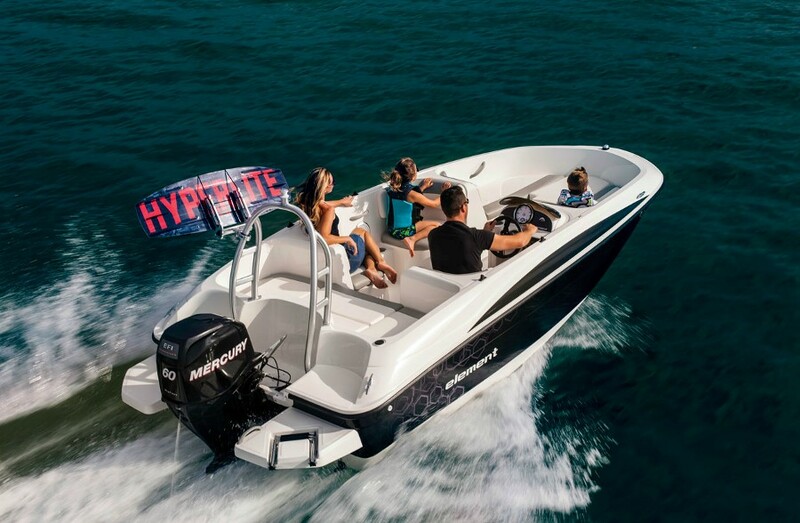 Chaparral H2O 18 Sport – Though it’s expensive for a starter boat with a retail price hovering around $25,000, the Chaparral H2O 18 Sport delivers a lot of bang for the buck. It comes fully rigged (including a trailer) and ready for use as either a waterskiing/wakeboarding boat, a general-use bowrider, or (if you opt for the Ski-N-Fish model) a fishing boat. Power is a 3.0-liter four-cylinder stern-drive coupled to an Alpha One drive. On the Ski-N-Fish model, the pair of jump seats at the rear pull out and mount high up in the bow and at the stern to create a fishing platform in minutes. When not in use for fishing, the seats mount to either side of the engine and the pedestals clamp neatly under the hatches beneath the bow seats. What really sets the H2O apart from competing bowriders, however, is the fact that Chaparral uses many of the same pieces-parts—like the chromed bilge vents and swiveling bucket seats—that go on their more expensive offerings. So even though it’s a starter boat, it doesn't look or feel cheap. For more information, visit Chaparral or read our full review, Chaparral H20 18 Sport: The New Normal. See Chaparral H2O 18 Sport listings. 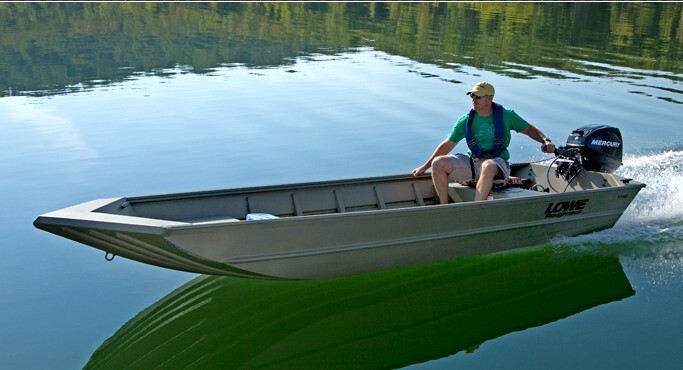 Aluminum can be a good way to go, when it comes to starter boats like the Lowe Frontier. 5. 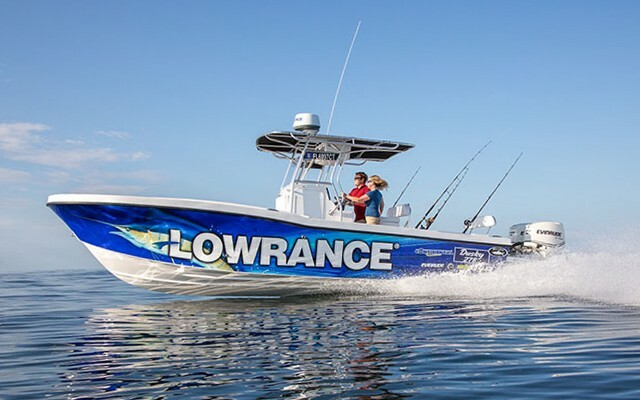 Lowe Frontier - This is a series as opposed to a specific model, but it's important to take note of because these aluminum boats are the ultimate in inexpensive utility boats. These are Jon boats, the all-American do-everything boating platforms that can be used in all environments, for all kinds of waterborne activities. Okay, so maybe they aren't ideal for wakeboarding. And you may miss those cushy seats and integrated accessories. But on the flip-side, they're amazingly inexpensive (you can get a small, stripped-down model for under $5,000), they're inexpensive to operate and store, they're rugged, and are much easier to maintain than fiberglass boats. 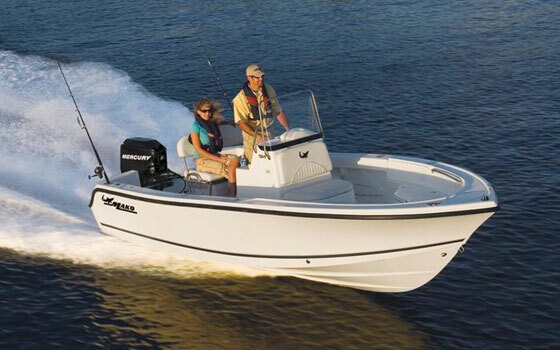 For more information, visit Lowe Boats or watch our Lowe Frontier Series video boat review. When you're ready to shop, check out these Lowe listings. 6. 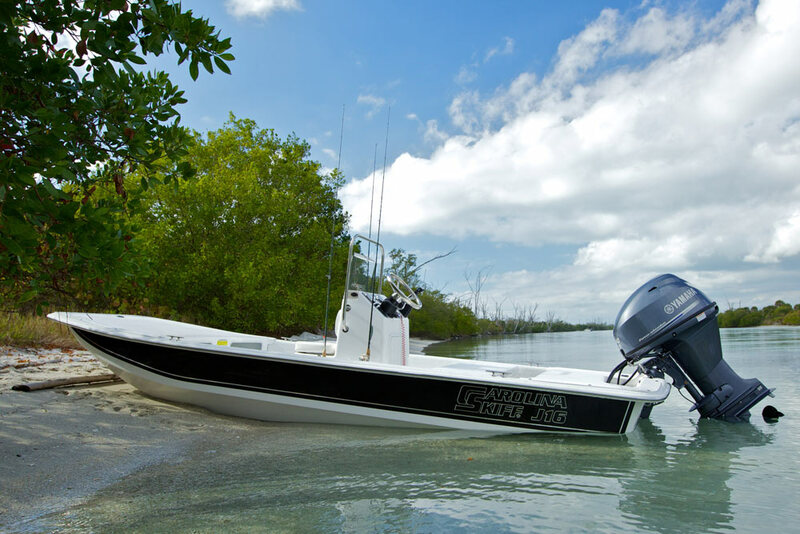 Mako Pro Skiff 17 – This starter boat is intended for anglers, and it’s quite unusual in that it has an “inverted V” hull design (which is very similar to a power catamaran). As a result, it rides smoothly through a chop and foot-for-foot, is one of the smoothest-riding boats of its size we’ve ever tested. The down-side is that this hull is a bit tender, and shifting a large amount of weight from one side to the other will rock the boat. 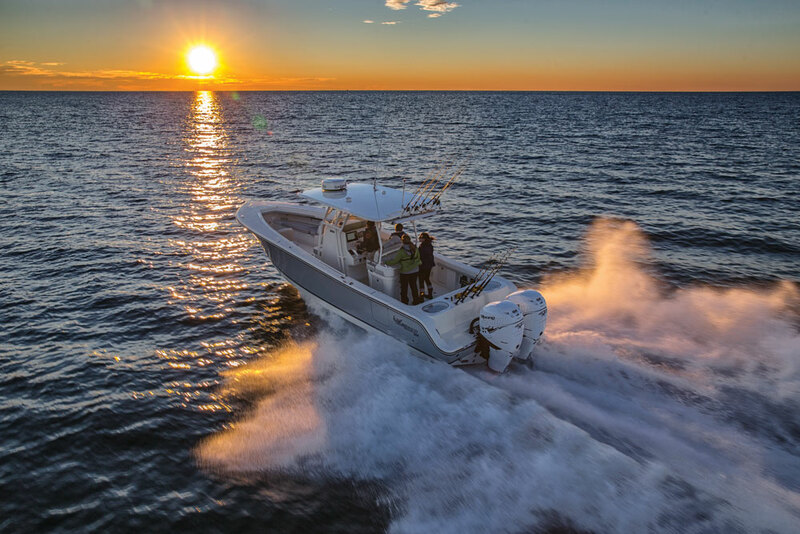 Price is another high-point, with an MSRP of $15,995 at the time of this publication—and that price includes the boat, a trailer, and a 60 HP four-stroke outboard. 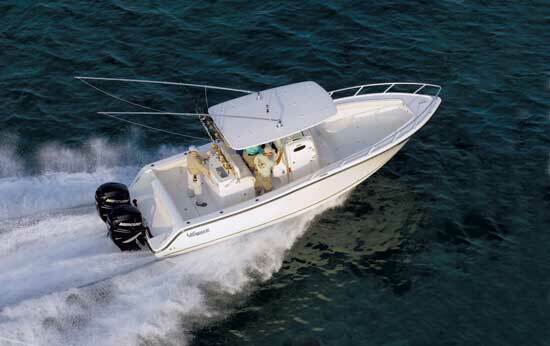 Unlike many starter boats, this one also comes with a lot of standard features such as an eight gallon livewell, a forward console seat, five vertical console rodholders, an 85-qt. cooler/seat, and forward and aft casting decks. 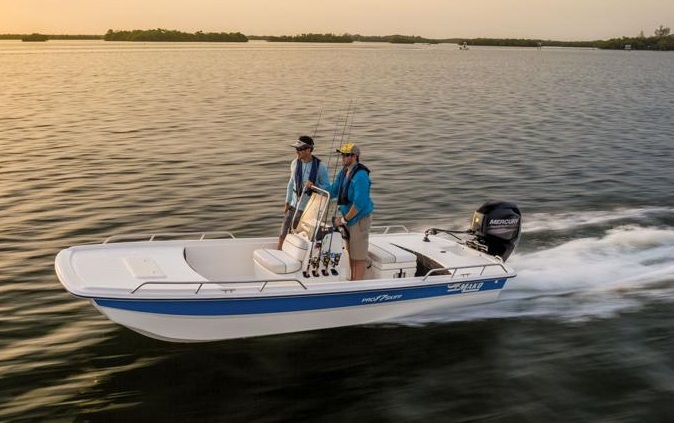 For more information visit Mako Boats, or read our full review, Mako Pro Skiff 17 Center Console: A Hull New Innovation, or see some Pro Skiff 17 CC listings. Can a bowrider double as a fishing boat? The Stingray 195 LX takes a shot at it. 7. Stingray 195 - The Sting Ray l95 LX can be easily converted to do a huge number of jobs. 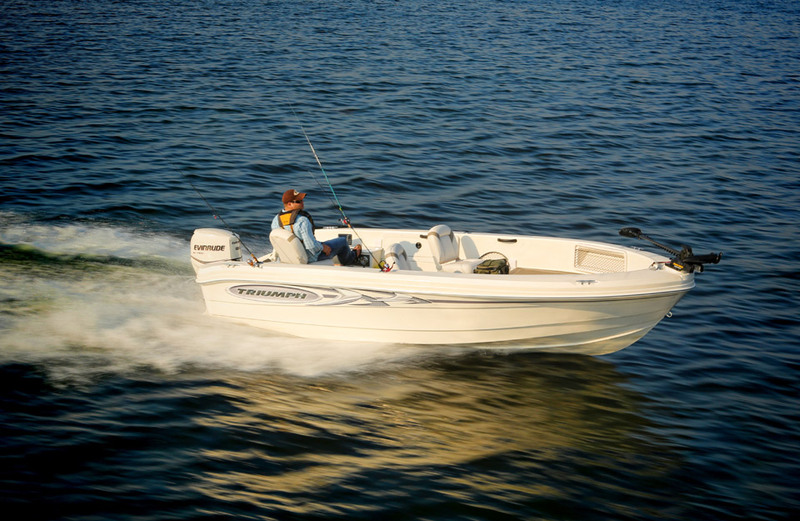 Leave it in the bowrider configuration for general fun on the water. Add on the forward casting deck and pedestal seat, if you think a bit of light-duty angling is a possibility. Grab a tow rope and put a wakeboard in the large in-deck locker, when watersports are the activity dejure. And when you feel like just zipping around the lake, you’ll discover that the 195 LX has plenty of pep with a small, inexpensive 4.3 MPI Mercury stern drive and it hits speeds in the mid to upper 50’s. Handling could be a bit tighter at the top-end, but it the boat weighed more or rode lower in the water, of course, it wouldn't go quite as fast. Pricing starts around $25,000 but goes up depending on power choice and options. 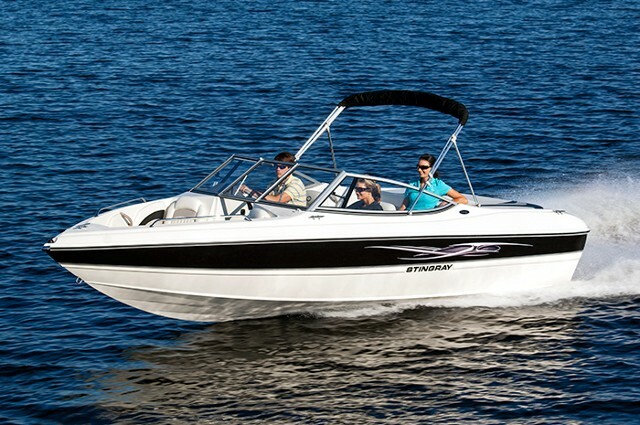 For more information visit Stingray Boats, or read our review: Stingray 195 LX Fish and Ski Package. 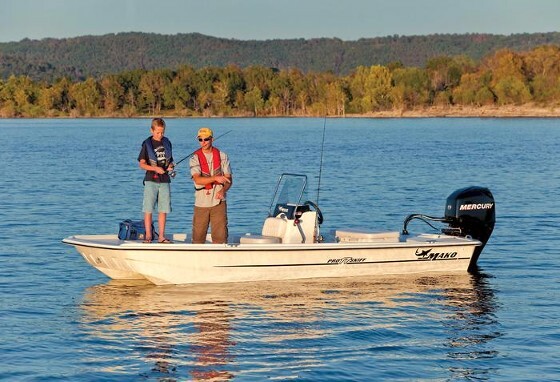 This Sweetwater makes a great starter pontoon boat. 8. Sweetwater SW 1570 - We like the fact that this boat delivers a lot of value for a base-model pontoon. Although it's small and inexpensive it maintains a high level of quality throughout, with a fiberglass helm station, quality vinyl on the seats, a table with built-in cupholders, a color-coordinated Bimini top with boot, and colored rail skin. And even though it’s merely 15’ long, there’s seating for up to seven passengers. It could use a little more power; with the base 20 HP outboard performance is not exactly thrilling. Upgrading to the 40 HP maximum makes us happier—but also drives up the $15,000 starting price-point. For more information visit Sweetwater, or read 10 Top Pontoon Boats: Our Favorites, which includes this model. Or, see some Sweetwater pontoon boat listings. Think you can break the Triumph 186? Think again! 9. Triumph 186 Sportsman – This boat comes in a number of incarnations: a tiller-steer, side console, dual console, and Fish-N-Ski models. But all share one thing in common, which is absolutely glorious for beginning boaters: they’re molded Roplene polyethylene plastic, and are essentially indestructible. Go ahead and ram that dock. Run the bow right into those rocks. Heck, lift the boat 20’ in the air and drop it onto a concrete floor—Triumph did it, just to prove the point. Pricing for this model can vary wildly depending on which configuration you choose and how big a powerplant you opt for, but the range is from about $20,000 clear on up to over $30,000. But unlike virtually all of other starter boats, you can’t cause major damage to it no matter how bad a newbie mistake you make. For more information visit Triumph, read our full review, Triumph 186 Sportsman: Roplene Plastic Fantastic, or check out some Triumph listings. When it comes to jet boats, Yamaha is a big player - and you'll be doing some playing yourself, if you get an AR 190. 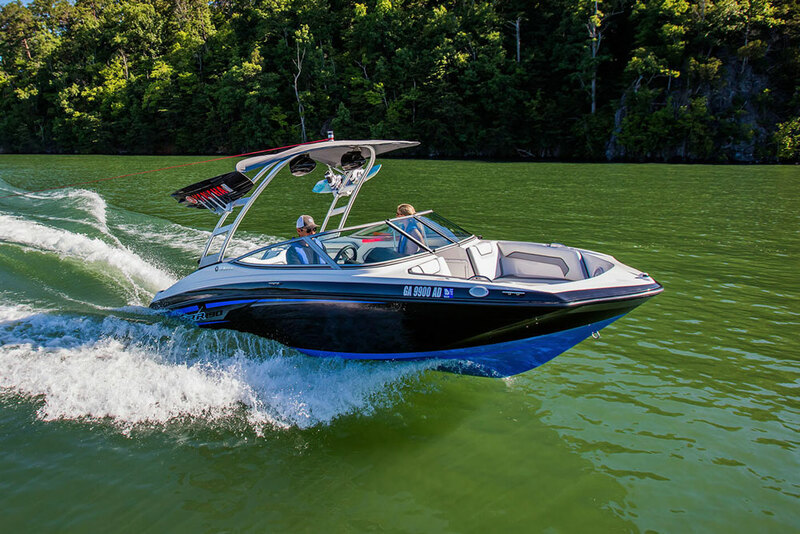 For more information visit Yamaha Boats, or read our review of the Yamaha AR/SX 192. Here are some listings for the Yamaha AR190, and for the SX190, too. Want more beginner boat ideas? Read Five Starter Boats that are Perfect for the Beginner Boater. Editor's Note: This article was updated in December of 2016.